And, this is where we begin our Advent series: with the understanding that Christ will ALWAYS win. Always. No matter what. Please join us this Advent season with our devotional "Daughters of Light" Advent 2015. Starts Monday Nov 30. Scroll down to see study posts. This year's Advent Study journal is quite a large PDF file, so we broke it up into sections. We recommend that if you'd like a hard copy, print a a section at a time and place in a binder or send all 4 off to a printer to have found together. We've condensed the file size as small as we could. Thank you for your understanding. 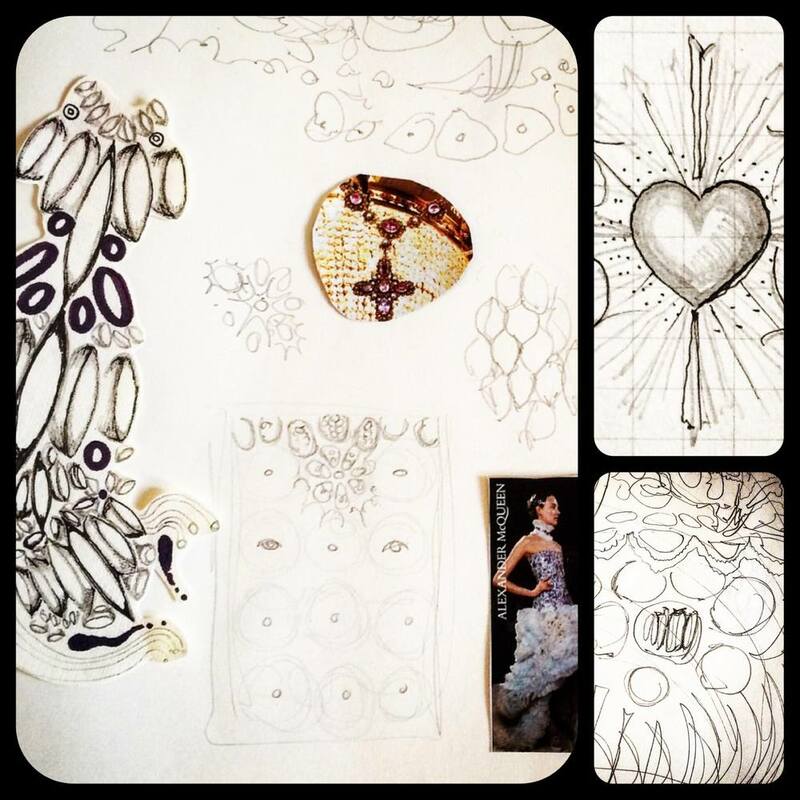 Day 1: Elements of a new design always come from everywhere and anywhere - scraps from earlier drawings, tiny doodles and zany scribbles... plus some major inspiration from the world of fashion and textile design. All of it together is like "dreamboard" for the look I want to create: my favorite part is playing around with ideas before settling on a core concept. Day 2: Once I've got a basic idea for the design I want to create, it's time to start sketching. I still keep all the "dreamboard" elements nearby; throughout the whole process, staying close to what inspires me helps keep the design coherent. Day 3: Pattern elements in pencil on paper. It's probably the most important part of the design process because it's giving me the underlying structure for everything that will be added later... like a blueprint! Day 4: With the basic pattern complete, it's time to add a graphic overlay - by hand - that will serve as a unifying compositional feature. Remember the little heart-doodle from Day 1? Well today it's taking center stage! Day 5: Yet another layer of details and extra shading for depth... it's a slow, meticulous process but it will pay off in the long run. Day 7: In the details, I always have to think about the end result: I want this design to be luminous and almost "glowing" and one way to achieve that is to add an underpainting of bright yellow in some areas. Since watercolor is transparent, the yellow will show through other colors, creating a warm visual effect. Day 10: And now for something completely different... after all the tinted layers of blue and lavender, it's time to go back over the same areas with a semi-transparent coat of the perfect shade of bronze: not too red and not too yellow. The effect will be full-on fabulous! Day 11: Almost finished! Just a few more special details to add, like this edging technique I often use - all these little hand-inked lines add a subtle "sharpening" effect, just like the digital filters on different photo apps... PS Monday is the big reveal! Don't miss it! Day 12: One last look at final details... tomorrow the finished design will be revealed! Marta Maria, "Daughter of Light" artist. Marta Maria is an international designer, makeup artist, and author: American by birth, French at heart, and currently based in Italy after several twists of fate (and faith). As a survivor of sexual abuse and domestic violence, Marta Maria has made it her mission to create a welcoming online community, aka "Messiharts" - where fellow survivors and friends from all walks of life can find a safe space to share life and celebrate the unusual, unique, and often messy beauty that begins in our broken places. Constantly exploring the boundaries of belief and the origins of creativity, her career has followed an unlikely path in the face of incredible odds, weaving together a lifestory of healing and hope with a God-given love for art and fashion. Her new website, entirely dedicated to makeup and beauty, is scheduled to launch in December 2015. Merry Christmas everyone! What a day filled with love, joy, and peace! I hope you have enjoyed and are still enjoying your families and friends brought together through Christ. Tomorrow is the day. We have been waiting with expectant joy for so long to celebrate our Savior's birth. Yet really we have only waited a short few weeks – Mary, the mother of God, waited months, offering her body as a sacrifice for him. Reflecting back on the story about Matthew from yesterday, I can't help but thinking, if he didn't help that woman, then who? Usually, when we go to the movies, we sit through a series of trailers that advertise movies coming soon. There was a time in my life where I thought that I would be a prisoner of my own fears and anxiety. Today’s passages come from tonight’s Evening Prayer in the Liturgy of the Hours (also known as the Divine Office). For those who don’t know, the Liturgy of the Hours is a series of prayers dating back to the times of St. Benedict. This particular Psalm is a favorite of mine. It reminds me that no matter what happens, I can always trust in the Lord and take refuge with him. Today’s passage from Sirach tells us not to give into our sorrow, anger, or jealousy. It’s not an easy thing to do, even in this holiday season. Some people have to deal with Seasonal Affective Disorder, which affects their mood this time of year. Have you ever had something that you seriously looked forward to? Think of graduation or your wedding day or a certain birthday. The anticipation for Christmas is one that most of us can relate to. Waiting is inevitable in our lives. We wait for the mailman to come, we wait for dinner to finish cooking, we wait in traffic, or we are waiting at the doctor’s office. We are constantly waiting for something in our lives. I have said it in a previous post, but I am going to say it again- I love when we see foreshadowing in the Bible and in our faith. It truly is God’s little ways that give us hope for the future as if he is giving us blueprints to follow. So yesterday may have left you with a little questioning of how else we can prepare for the birth of our Lord, and how we can fully ‘prepare’ during Advent. Its funny to read the introduction to my last post and then to introduce this post, it seems very contradicting. Growing up, in an effort to help us prepare for Christmas and to fully embrace the Advent season we didn’t decorate until days before Christmas. For all those that know me personally, and not just through the social media beat, they would know that the time from Thanksgiving to the Epiphany is my favorite time of year. I often wonder what God saw in Paul, on his murderous journey to Damascus. Paul expressed no remorse, yet God was merciful. He proved to have greater plans for Paul than Paul did for himself. And Paul, however blinded (quite literally) to his fate that day, came to recognize this. Three months ago, my husband and I lost our first child. We were eight-weeks in, joyful with anticipation, delighted. After three long years, God had finally called us to be parents. I once heard it said, that when we have debt, we are a slave to that debt. As a barely-out-of-college loan holder and new homeowner, that alluring phrase has caused me great anxiety over the years.